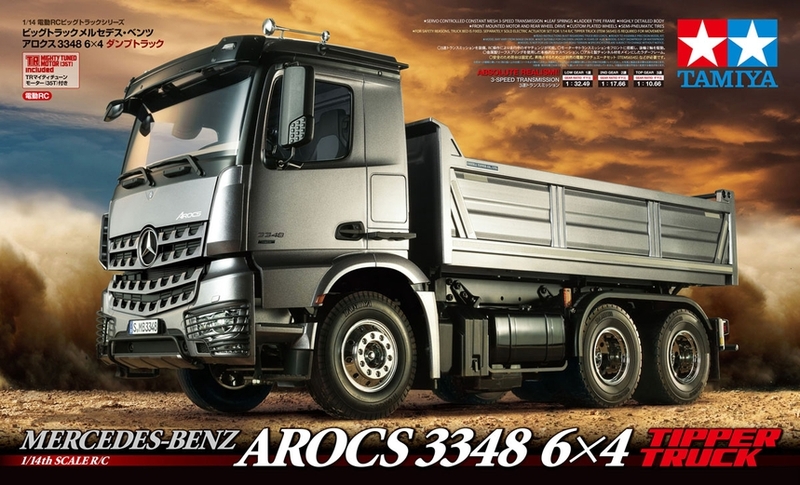 This is a highly accurate 1/14 scale radio control model that recreates the Mercedes-Benz Arocs dump truck. 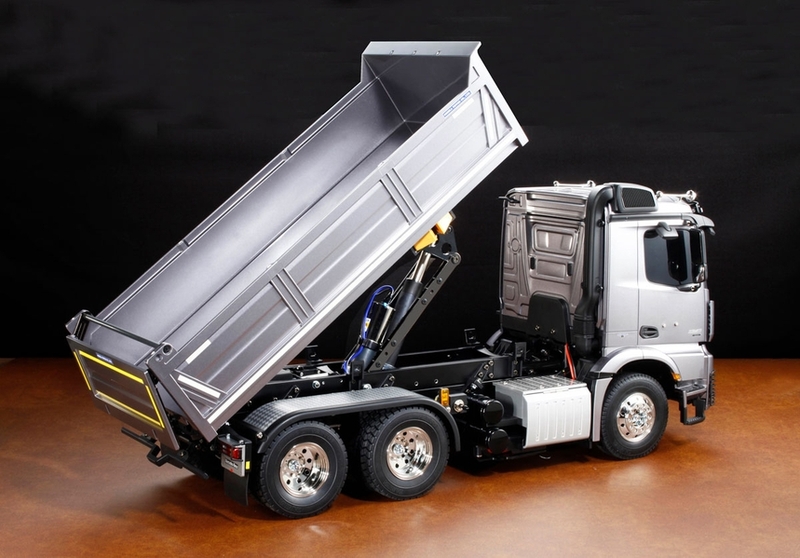 It features a highly realistic truck bed section behind the cab which can be operated by the radio transmitter, using the separately-sold Actuator Set (Item 56545)! • 1/14 scale R/C model assembly kit. Length: 576mm, Width: 190mm, height: 267mm. • Injection molded body, including depictions of cab rear handrail and step details. Separate parts recreate side mirrors and visor, etc. 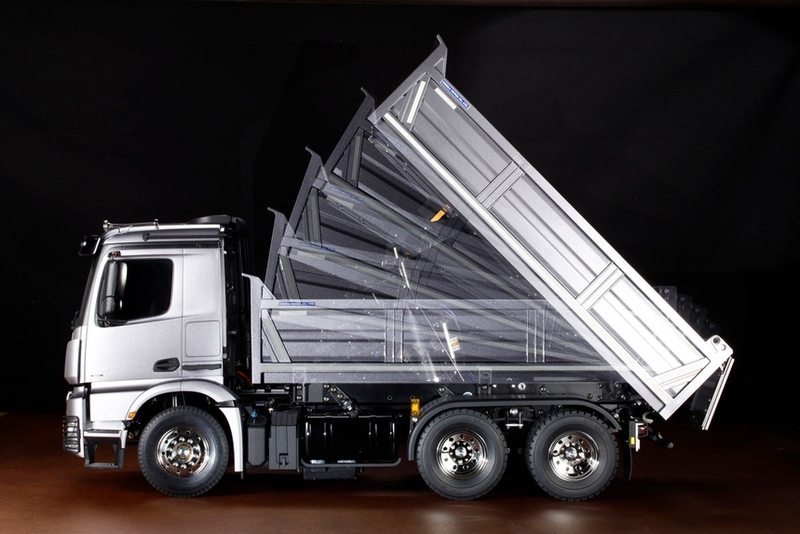 • 3-axle chassis has a tough ladder frame with aluminum side channels and resin cross members. 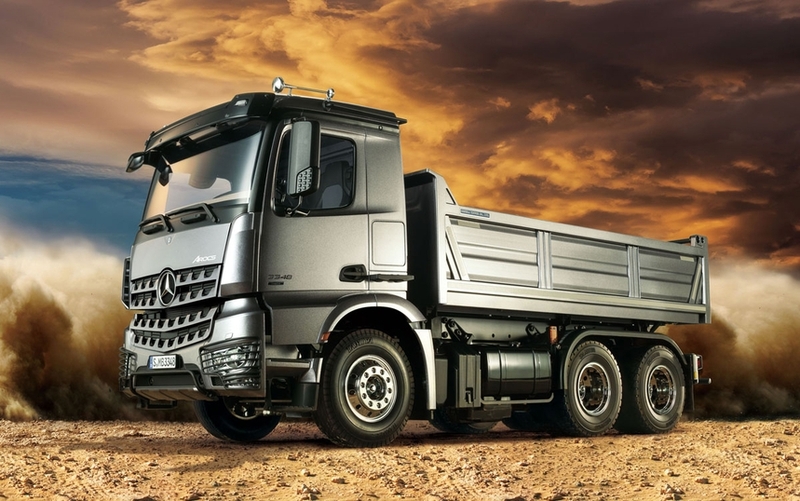 • Truck bed section is comprised of metal subframe and resin panel sections. • Compatible with Actuator Set for realistic truck bed motion. • New TR mighty-tuned motor (35T) provides twin rear axles with ample power to carry loads in the truck bed. • Newly designed rear tires, rear fenders and taillights. • 3-speed transmission can be controlled via a separately sold 4ch R/C transmitter. • Metal leaf spring dampers with built-in coil springs provide durable suspension. • Compatible with separately-sold MFC-03 (Item 56523) (or MFC-01, Item 56511) for realistic lights and sounds. • Requires: Tamiya Attack 4-channel radio, steering servo, ESC, 7.2volt battery & battery charger, and Tamiya TS spray paint.